Dan Fernandez has been in construction for 39 years and has had the opportunity to start and grow his own business in McKenzie Contracting LLC. McKenzie Contracting is a heavy civil contractor with an emphasis on site work and underground utilities. The business was formed approximately six years ago and is based in Tampa. Customers include the federal government, municipalities, airports, and private sector entities. Fernandez reached out to the Chamber of Commerce to assist with the growth of McKenzie Contracting. That’s where he started working with Florida SBDC at Hillsborough County business consultant Corey McCaster. “It was a blessing because we had a down year in 2017 where our revenue stream was probably a million dollars below our sweet spot, and as of January 8, 2018, we started construction on over five million dollars worth of work,” Fernandez said. 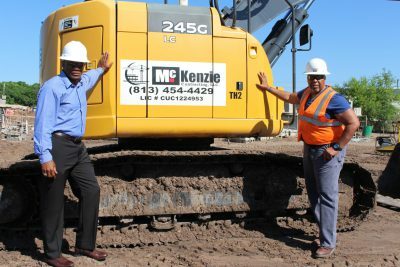 McCaster assisted Fernandez in helping McKenzie Contracting get the necessary financial assistance and create a strategic plan to get the company back on its feet. McCaster was also able to assist Fernandez with getting $4.2 million in government contracts so McKenzie Contracting could implement their plans for the upcoming year. Moving forward, Fernandez plans to continue consulting with McCaster to assist the business with future growth plans, and to make sure they stay on track with existing plans. "I feel having him aboard with me will keep me focused, keep me on the right track. I have some opportunity to diversify in some other business and they brought me right back in line to say let’s get McKenzie Contracting solid. Let’s get them stable, and that’s what’s been a blessing to me."